Utagawa Toyokuni I (1769-1825) Portrait of Ichikawa Danjuro VII as Soga No Goro from the series Actors and Modern Mirrors, 1823 - 1825. Oban. We are very pleased to show two actor portraits by Toyokuni I from a rare series and which form a fine pair - mirrors in both senses of the word. This second, is of Ichikawa Danjuro VII as Soga No Goro. 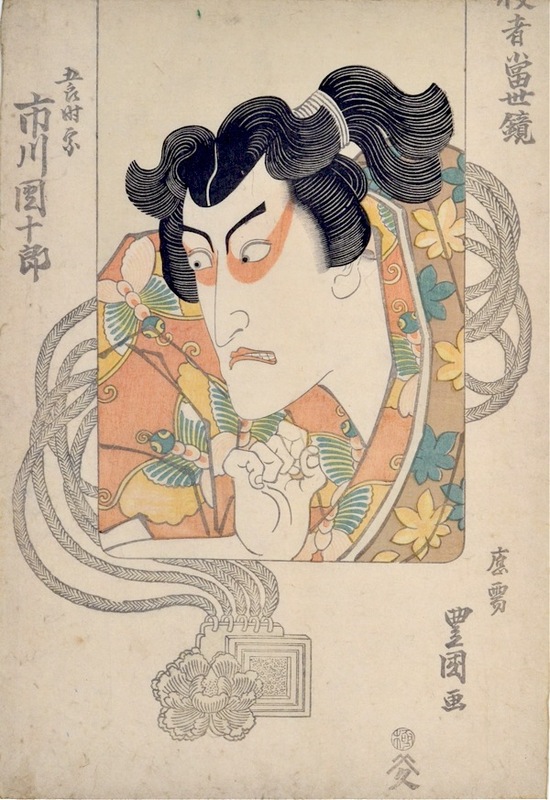 Toyokuni used mirrors (an early use of the device) to show reflections of actors in role, in this case portraits of the two famous Soga brothers of the kabuki dramas and novel, Soga monogatari. The title, Yakusha tosei kagami, suggests that the rectangular mirrors are modern - i.e. foreign and made of glass. Highly polished bronze mirrors - usually round with a bat-like handle, were imported from China after 2000 B.C. There was no glass manufacture at all in Japan until the 18th century when the Portuguese introduced it into Nagasaki. Glass mirrors were unknown until the 19th century and this novelty is probably what is illustrated here. The object pictured has a highly decorative brocade and chased strap and harness. The mirror reflects the image of Ichikawa Danjuro VII as Soga No Goro. It is a very fine, very inventive piece. The portrait is delicate and the colouration subtle. Soga monogatari is one of the enduring folk heroes of Japanese legend and frequently depicted in Japanese art. The story was a popular subject for kabuki audiences: in 1175 Kudo Saemon Suketsune had his cousin Sukemichi assassinated in order to gain an inheritance. Eighteen years later, in 1193, Sukemichi’s two sons Juro Sukenari and Goro Tokimune revenged themselves by killing Suketsune in the course of a hunting party on Mount Fuji. Juro was killed in the fight but Goro was taken prisoner. What follows is the crux of the play’s tragedy for Japanese audiences. Although the shogun, Minamoto no Yoritomo sympathised with the brothers' loyalty and was inclined to pardon Goro, he was persuaded by Suketsune’s son to execute him. The conflict between the duty of the sons and the authority of the state remains a vital key to understanding both bushido (the way of the samurai) and the feudal system of the shogunate. The portrait of Goro is particularly expressive and striking with stylised red make-up picked out around the eyes. His expression is subtly captured as if looking out of the palimpsest frame of the mirror. Toyokuni I is often criticised in his later works but these two portraits show exceptional skill and brevity. A fine piece in very good condition, trimmed slightly at the top, colour is superb - a fine impression. A copy of this print is in the Deerfield Museums Collection.